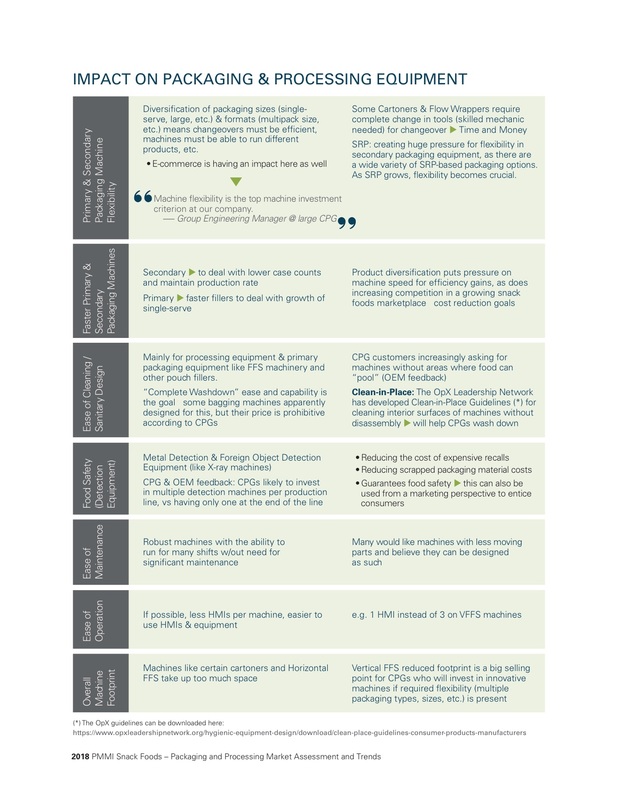 Driven by increased demand for various packaging sizes & formats, the top unmet packaging machinery needs of CPGs in the snack food industry are flexible and faster machines – for both primary and secondary packaging and processing. According to “Snack Foods – Packaging and Processing Market Assessment and Trends 2018” by PMMI Business Intelligence, diversification of packaging sizes and formats means changeovers must be more efficient, and machines must be able to run different products. “Machine flexibility is the top machine investment criterion at our company,” said one group engineering manager at a large CPG. At issue, some cartoners and flow wrappers require a complete change in tools by a skilled mechanic for changeover, at a cost of lost production. Shelf Ready Packaging (SRP) is also creating huge pressure for flexibility in secondary packaging equipment – as SRP grows, flexibility becomes crucial. Product diversification also adds pressure for increased machine speed and efficiency gains, as does increasing competition in a growing snack foods marketplace. Other unmet needs include sealing equipment issues, better process control, lower number of defective packs, better post-purchase equipment support and issues with peel-and-reseal label packaging. For more details about the snack foods market for packaging and processing industry, download the FREE Executive Summary or access the full report here.